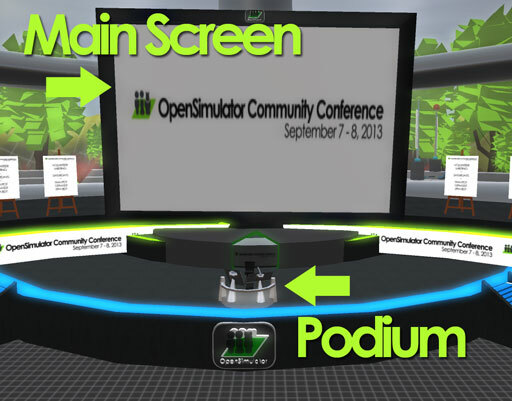 Thank you again for agreeing to speak at the OpenSimulator Community Conference 2013! As we get closer to the event, we wanted to give you more information about how to prepare for your presentation. 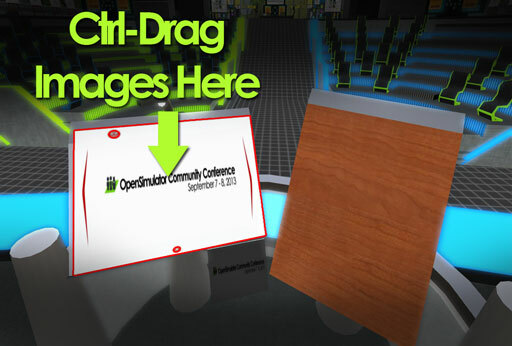 The OpenSimulator Community Conference 2013 will take place entirely online in an OpenSimulator grid designed specifically for the event. If you have never given a presentation in OpenSimulator before, we encourage you to log in and get comfortable with the interface well in advance of the event. Speakers must use a headset microphone, preferably with a separate mute/volume control. Unfortunately, built-in microphones on laptops and computers can allow other sounds to bleed through the stream, causing painful echo loops and distortion for other speakers and audience members, therefore, we require all speakers to use a headset microphone for their presentation. If you do not have a headset microphone, please purchase or borrow one prior to your presentation. If possible, try to limit any distracting ambient noises in your local environment such as fans, barking dogs, ringing cell phones, etc. We will be streaming your audio output both to the virtual conference center on the OpenSimulator grid, as well as through the live UStream channel, so it’s important that your audio quality be as clear as possible. To connect and log in to the conference grid, you will need to use a special client called a “viewer”. We highly recommend that speakers use the OSCC Viewer, a customized viewer we have developed specifically for the conference that is pre-configured with all of the connection details necessary to connect to the conference grid. Speakers may also have one of two different types of accounts – a local account, which will have a first name and last name like “Joe Smith”, or a hypergrid account, which will be in the format firstname.lastname@yourgrid.com:8002. Refer to the email you received when you registered for the conference to see which type of account you selected. 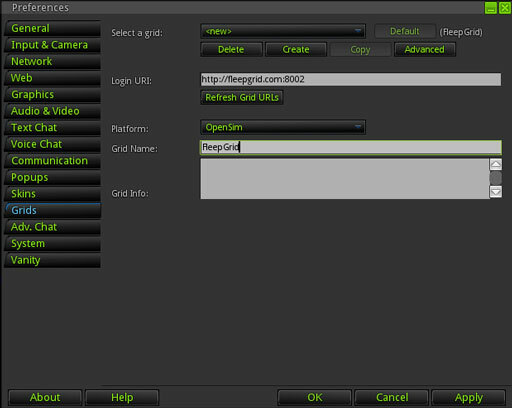 Once you have your slide images all renamed, you will need to log into the conference grid to upload your images. HyperGrid users, it is very important that you log into the conference grid and upload your slides there instead of uploading on your home grid! This will help minimize any permissions issues. Once you have logged into the conference grid, the first thing you need to do is set your viewer to automatically give all uploaded images full permissions so that the images can be displayed for the audience. 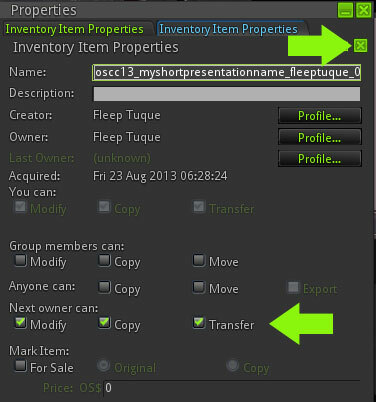 In the OSCC Viewer, go to Edit > Preferences > System tab > Building Tab and check the boxes for Next Owner Permissions to Copy, Modify, and Transfer, and then click Ok.
1. Log into the conference grid. 2. Open the Map, and search for the region “vLab” and teleport to the destination. 3. At the podium in the room, right click and choose to “Sit” at the presenters seat. 5. A notice should appear in the upper right corner of your screen, click “Go to Page” to visit the website. 6. On the web page, choose and upload your PDF file. 7. You will see the images processing on the podium display. When it has finished, click the yellow folder icon to download your converted image slides. 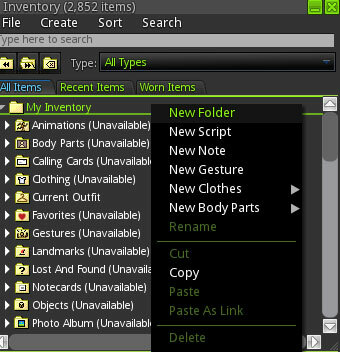 Your image files will appear in a new folder in your Inventory named according to your original PDF file name. The image slides are automatically numbered in the conversion, so you should be all set! The conference presentation system offers a variety of ways for you to show visuals during your session. Presenters may also bring or build small displays, demonstration objects, posters, etc. that can be placed either on the stage in front of the auditorium, or there is additional space behind the audience seating. We highly recommend that speakers bring at least a draft version of their converted slide images and any builds or displays to the Speaker Q&A session so we can troubleshoot any potential issues in advance! The system has two main components – the Main Screen that the audience will see, and the Podium, where you will be in control of what is displayed. 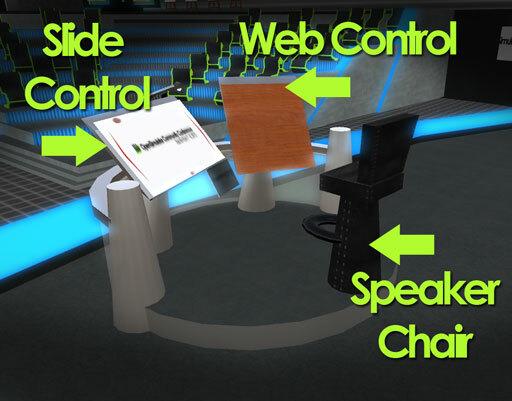 The Podium itself has three components – the Speaker Chair, where you will sit in order to “take control” of the system, the Slide Control podium, where you can control what slides are displayed, and the Web Control podium, where you manage which websites are displayed. To begin, right-click on the Speaker Chair and choose to “Sit”. The podium should acknowledge that you have gained control of the presentation system in local chat. When you sit down, the system will automatically center your camera view on the two control panels, but at an angle where you will still be able to see the audience as well. The next step is to load your prepared slide images into the Slide Control podium. 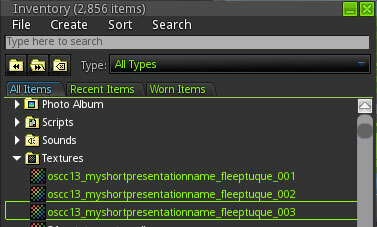 Locate your slide images in your inventory and shift-click to highlight all the slide images at once. 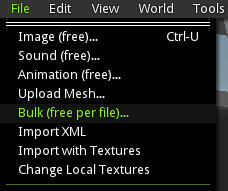 Then, hold down the CTRL key and CTRL+DRAG the images onto the center of the Slide Control podium. You should see the podium highlight in red while dragging the images over. Next, click the red “Home” button at the top of the Slide Control to reset the system and load your slides. A pop up notice will ask if you wish to start from the beginning, choose “Yes”. You should then see your first slide appear in the center of the panel. Note that the smaller, greyed out panel below will preview your next slide at the same time. To scroll through your presentation, use the narrow red arrows on either the left or the right side of your slide. You can also left click anywhere on the slide to “point” on the image – a red pointer will appear on the large screen the audience sees wherever you clicked. This is useful to point out specific areas of your slide. If you only have slide images to display, that’s it! That’s all you need to know to use the presentation system! When you’re finished, click the red X at the bottom to delete your slides from the system. You should still be sitting in the Speaker Chair to be in control of the presentation system. To switch the display from Slides to Websites, simply click the wood textured podium on the right. A floating action bar will appear over the podium, where you can click to enter the URL of the website you wish to display. Enter your URL address in the text field and hit enter. As soon as the website loads, your audience will see the same website you see. Remember however that each person’s view of the website is unique, so they will not see any interaction you perform on the webpage. If you need to click to start a video, for example, you will have to ask the audience to do that individually on their own view of the website. To switch back to showing your slides, simply click on the Slide Control podium on the left, and the website display will automatically disappear for your audience. You can switch between slides and websites at any time by clicking the appropriate panel. 4. Click the “Add a New Contact” button and send a contact request to “fleeptuque” to be added to the OSCC13 Speakers group on Skype. Note that this Skype channel will serve as our backup communication channel if the conference grid experiences technical difficulties. 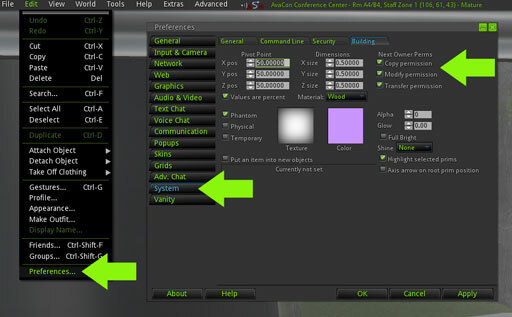 To disable the automatic “AFK” feature in the OSCC Viewer, log into your account and then from the top menu select Edit > Preferences > General Tab > UNCHECK the box “Go away when idle”. 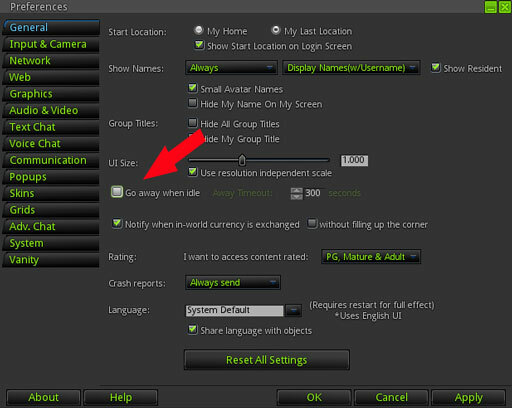 If you are using a different viewer, you should find a similar option under that viewer’s preferences as well. Teleport to the region where the presentation will take place. If the region is full and you can’t get in, alert conference admins using the Skype OSCC13 Presenter channel. The Streaming Team will pull you and any co-presenters and the session moderator into a chat or call on Skype. They may do a quick test call to check your connection and audio levels. Simultaneously, you need to make your way to the stage and sit on the black chair at the center podium to add your slides to the presentation system. Approximately 10 minutes before the end of your session, your moderator will IM you to let you know to begin wrapping up. If you haven’t taken any questions yet and intend to do Q&A, you should probably start. Approximately 5 minutes before the end of your session, the moderator will IM you to start wrapping up.. If you are unable to reconnect after a few minutes, if at all possible, please call or text Chris Collins (Avatar: Fleep Tuque) at 1+ (513) 833-4047 to alert the conference team to your extended outage. In the worst case scenario, we will inform the audience about the technical difficulty, and if possible, either reschedule your presentation for later in the conference or work with you to schedule a time to film your presentation after the conference for the video archives. Keynote speakers and speakers who can’t make the date/time for their specified track are welcome to attend any of the Q&A sessions. If possible, we strongly suggest you have at least a draft of your presentation slides ready for the Speaker Q&A session so you can practice using the display system we provide. If you plan to use your own presentation system, please bring a copy with you to the Q&A session so we can test it and ensure that it works properly on the conference grid. If you have any other questions or need any assistance whatsoever, please don’t hesitate to let us know. Thank you again for being a part of the OpenSimulator Community Conference 2013 program and we look forward to a terrific conference!